Welcome to our historic Globin cabin! Well appointed with antiques, art, and creature comforts, it has a warm mountain feel with an eye toward appreciation of the area’s history. It easily sleeps two couples or a family in two private sleeping areas, each with their own bathroom and shower. It is equipped with all the amenities you expect from a modern vacation rental and more, including a fully equipped kitchen, entertainment center (including stereo with iPod dock), wireless DSL, antique hutch /bar, and a spacious deck with gas barbeque and comfy patio furniture overlooking the large, fully fenced yard. The cabin is furnished with a pillow top queen bed and an extra thick fold-down futon couch (double), both supplied with quality linens. Off-street parking and access to the back yard to store a small boat or vehicle behind a locked gate. The cabin is perfectly located to provide you with ready access to all things Tahoe. From our quiet neighborhood walk just two short blocks to the lake and boat-launch ramp, or enjoy a beautiful walk through the historic neighborhood and nearby meadow reserve. 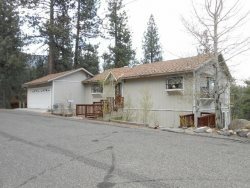 Great bagels, coffee, and a variety of restaurants are also just a few blocks away, as are the Recreation Center (Olympic-sized swimming pool, ice skating rink), Lake Tahoe historical museum, the Timber Cove Marina (boat rentals). This is located only 2 miles from the casinos and all the entertainment they have to offer, as well as being on the bike route through South Lake Tahoe. You will have easy access to the areas hiking in the summer, and in the winter it is an ideal location for skiers, just 2 miles from Heavenly Ski Resort and centrally located between Kirkwood, Sierra and Squaw Valley ski resorts. This is the quality cabin get-away you are looking for. No smoking, please. Pets OK for extra nightly charge.